County Indoor pool and spa, continental breakfast, HBO. In the heart of the Silver Valley. Hi Speed internet access. Pets allowed. Rooms: 61. 601 Bunker Ave.
Bell Bay Campground Benewah County Camping units, day use, potable water, trail system. 26 sites. Upper loop reservable as a group site to accomodate up to 60 people in 10 trailer spaces. Nearest boat ramp is in Harrison. Open from late spring to late summer. Attractions: Lake Coeur d'Alene, boat dock, hiking, Harrison Contact the Coeur d'Alene River Ranger District for actual opening and closing dates. Blackwell Boutique Hotel Kootenai County 7 high-style guest suites located in downtown Coeur d'Alene. Original artwork, romantic fireplaces and sophisticated common areas are just a few of the amenities that make for a respiteful stay. Walking distance to the beautiful shores of Lake Coeur d'Alene, shopping downtown, local dining, scenic hiking & biking trails, and the McEuen and City Park 820 E. Sherman Ave.
County Party/houseboat, fishing, personal watercraft, and ski boat rentals. Fine family dining at The Waterfront Restaurant. "Boardwalk Boatique" art show on selected Saturdays. Lakeside guest accommodations with views of the Selkirk Mountains. All-season covered deep-water moorage and secured storage. Restaurant. Rooms: 2. 958 Blue Diamond Rd. North loop: 10 campsites including the host site. South loop: 17 campsites. Amenities include a potable water well with a hand pump and vault toilets in each loop. Located 38 miles from Coeur d'Alene at the confluence of Bumblebee Creek and the North Fork of the Coeur d'Alene River. Cavanaugh Bay Resort Bonner County Luxury guest suites: private balcony, spacious living rooms, kitchen, fireplace and flat screen TVs. County Modern log cabins on 300 acres of scenic North Idaho. Kitchen units Rooms: 7. 5361 River Rd. County Elkins on Priest Lake is the Northwest's finest log cabin lakeside resort with a restaurant, lounge and boat slips. The ideal location for seminars, weddings, and retreats. Rooms: 28. 404 Elkins Rd. County Closed. Farewell to the blue Building! As of spring 2018, no decision had been made for the future. This is one of the largest pieces of private land at Priest Lake. The “Grand View” is there, just not the buildings. County Overlooking The Trail of the Coeur d'Alenes, the Lakeview Lodge offers 8 first floor rooms, with single Kings or 2 Dbl. Beds private baths, new air conditioners and lake view decks. We also have 2 second floor suites with kitchenettes and separated sleeping areas. Renovations are under way in the remaining 5 suites. Rooms: 8 110 N. Coeur d'Alene Ave.
County Just 4 blocks from the St. Joe River. Restaurant and pool within 1 block. Pets allowed. Rooms: 28. 1117 Main St.
Red Horse Mountain Lodge Kootenai County Beautiful guest ranch neighboring Blue Lake. Go horseback riding, kayaking, fly fishing, hiking, or mountain biking and then relax in one of our luxury cabins or have a meal prepared by our professional chef. Stargaze in our cabinside outdoor hot tubs or bask in the sun by the pool. Live music Saturday nights in our outdoor amphitheater. Rooms: 16. 11077 E. Blue Lake Rd. County In the heart of downtown Coeur d'Alene. Continental breakfast provided. Rooms: 17. 621 Sherman Ave.
County Located right next to the Factory Outlet Malls. Kitchen units, pool/spa, breakfast. Rooms: 71. W. 4105 Riverbend Ave.
County Silver Beach Resort: Celebrating 100 years operating as a resort. Rustic lakefront cabins on beautiful Spirit Lake! Experience the serenity of our warm, clean lake, with nice sandy beaches. Great for swimming, kayaking, water skiing, fishing, or any other water sport. Plenty of biking trails and superb hiking trails surround us. Evenings spent around the campfire are subject to fantastic memories. 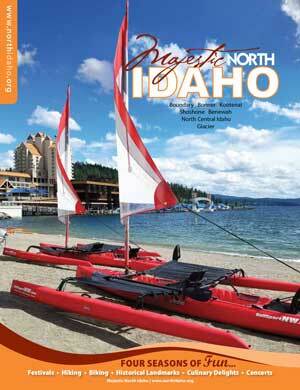 Come relax at Idaho's "Best kept secret" in north Idaho. We have 4 cabins and 1 RV ready for your arrival. Open May 1 through September 30. See our website at www.silver-beach-resort.com or call 208-623-4842 for more information. 9724 W. Spirit Lake Rd. County St. Joe Riverfront Bed & Breakfast and House of Travel offers 135' of riverfront at the southern end of Lake Coeur d' Alene. The St. Joe River, the highest navigable river in the world flows past the St. Joe Riverfront Bed and Breakfast. This beautiful new home (3700 square feet) was built to take advantage of the magnificent views of the mountains to the south, west, and east with the serene, shadowy St. Joe (135 feet of river frontage) as your front yard. Just two miles west of St. Maries, Idaho. Rooms: 4. 816 Shephard Rd. Super 8 Moscow Central Idaho Beautifully renovated. Adjacent to University of Idaho. Surrounded by Restaurants, Lounges & Convenient Stores. Business Rooms feature Rocker, Recliner Chair and office work station Rooms: 60. 175 Peterson Dr.
Super 8 Motel Billings Montana Newly renovated in 2004. The Kings now feature a computer desk with plenty of outlets and phone jacks, and a wet bar with a microwave and refrigerator. You can enjoy a work out in the new exercise room or meet with family and friends in the comfortable and spacious lobby. For family reunions, a comfortable meeting room was added to host many activities. Exercise room Rooms: 106. 5400 Southgate Dr.
Super 8 Motel Spokane West Washington We offer park & fly, airport shuttle, and park-stay-fly. Our relaxing indoor pool and spa is open 24 hrs, and a deluxe continental breakfast (not a toast bar) is available to everyone from 6:00a.m.-9:30 a.m. everyday. We have business class rooms, and suites with refrigerators and microwaves available upon request. Located just 5 minutes away from Northern Quest Casino, Fairways Golf Course, Spokane International Airport, Fairchild air Force Base, Auto Auction and Downtown Spokane. If you?re traveling to North Idaho or leaving we can accommodate you at our Super 8 West located off I-90 exit 272. It is a 30-45 minute drive to Idaho. W. 11102 Westbow Blvd. County Located in the heart of downtown Coeur d'Alene. The largest B&B in the Pacific Northwest. 1 and 2 BR suites. Special anniversary & honeymoon suites. Ski and spa packages available. Rooms: 16. 105 Wallace Ave.
County Suites, ski, recreation and fun packages available Gateway to the Route of the Hiawatha & The Trail of the Coeur d'Alenes. Silver Country 1000 mile trail system. Rooms: 59. 100 Front St.